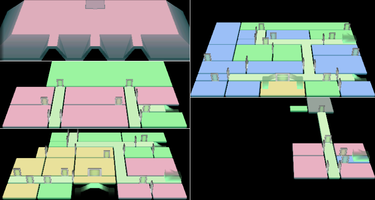 The Pipe Room in the Nintendo 3DS remake. The Pipe Room (Japanese: 配管室 Piping Room) is a room in Area Four of Luigi's Mansion. Once Luigi enters the Pipe Room, a set of green Flying Fish and Red and White Grabbing Ghosts attack. After Luigi captures them, he uses an Ice Elemental Ghost to get to a valve that stops the flow of water. This causes the Key to the Cold Storage to appear. The Pipe Room contains a crate, a bucket, and a frozen barrel. The river of water is untouchable until Luigi freezes it. 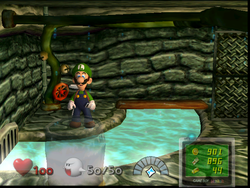 The Pipe Room and the first floor Washroom are quite possibly the only necessary rooms in the game which are never required to be lit up (unless of course the player is trying to catch all fifty Boos), as Luigi can completely ignore the Grabbing Ghosts, freely freeze the river of water and turn the waterfall off to obtain the key to the next room. This page was last edited on September 26, 2018, at 21:30.